Multi-vitamin pills have a time and a place, but some people would rather get their vitamins from real food. 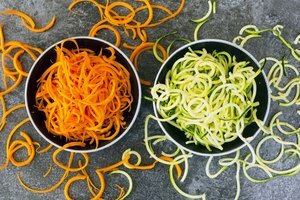 It's more natural than some horse pill from a manufacturing plant--and veggies taste better too. Of course, if it were that easy, we would all be eating our way to the recommended daily amounts, right? Wrong. It really can be easy to get your vitamins naturally. You just need a microwave and butternut squash. That's right, we've taken the intimidation out of cooking this gourd. Pretty soon, you'll be microwaving your way to wellness. 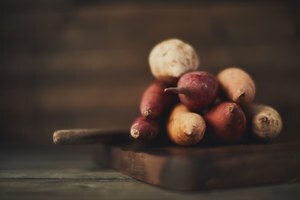 One cup of butternut squash provides plenty of vitamin A and about one-third of the daily recommended amount of vitamin C for the average woman. This wonder squash also contains plenty of vitamin B-6, folate, and manganese. Move over, bananas. There's a new oddly-shaped potassium packer around. 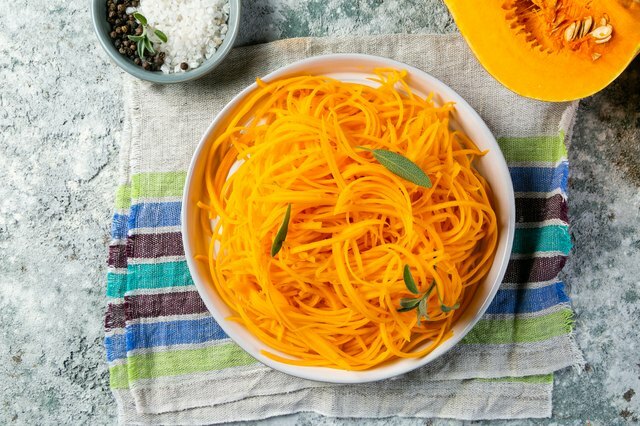 That's right, just a cup of butternut squash has more of this nutrient than a full banana. While microwave squash recipes are fairly simple, the trick is in picking the produce. First, test the ripeness of a squash by comparing its weight to others in the store. 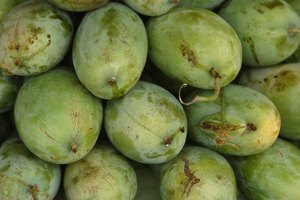 If the vegetable you're considering is considerably lighter than others its size, it's not ripe yet. If you're the type who knocks on watermelon all summer to find the juiciest ones, then you already know how to pick a great butternut squash. A squash that sounds deep and hollow when you thump it should be nice and ripe. But if your ears think it's dull, your taste buds will too. Before you commit to a veggie for your microwave, check the stem. Firm, full, and intact stems with dark brown tones indicate that the squash is ready for your microwave. Finally, give the skin a once-over. If it's a matte, deep beige color, you have found a good one. That's right; oily skin doesn't look great on squash either. A little pale spot is no problem—that's just where the squash sat while it grew. Cut about six slits into the skin for ventilation. Make sure the knife goes all the way through the skin, but it does not have to pierce through the other side. Microwave on high for 10 minutes. 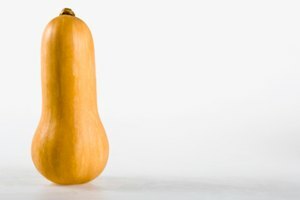 If your squash is a little on the large side, you may need to increase to 12 or 15 minutes. Carefully remove the squash and open it up. Add any desired spices. Enjoy! *Watch out! This method steams the butternut from the inside and through the slits. Hot steam will make it through and can hurt you. Make sure to remove the veggie with care. Pour the water into a microwave-safe baking dish. Put the squash in the microwave with the cut sides facing down in the water. Microwave for nine to 12 minutes total. You can stop it halfway through to rearrange the halves if necessary. Check for tenderness with a knife. If it's your desired tenderness, carefully remove the dish and scoop the squashy goodness. Add any spices you desire and enjoy the time you saved. If you want to use the microwave for squash cubes, you're in luck. You can modify the second method to fit your needs. First, peel the squash before you start, and then proceed as directed. 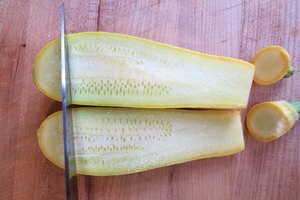 When it's done, you can easily cut the squash into bite-sized cubes or any shape that fits your needs. Just because it's simple doesn't mean that microwaving a butternut squash has to be a snooze fest. If you already love the idea of microwaving your vitamins, consider adding some super spices like turmeric, sage, chili, or cumin. It's about time we all had a way to make dishes that taste great, nourish us, and don't require all of our time. Medical News Today: What's to Know About Butternut Squash? Mackenzie is a writer with six years of experience in the wellness space. She first got interested in health and wellness in college, when she had to be her own medical advocate in getting an accurate diagnosis for her autoimmune disease. Since then, Mackenzie has written for NurseCore, Epic Health Services, and several physician offices. She co-owns a martial arts gym with her husband, where she advocates for mental and physical health in her small community.